My family and myself have been dealing with the team at Roger Davis Real Estate for what must be some 20 years now and I can attest I have found the quality of sales and rental staff are second to None! Yes, a Big Statement! Being a family business run by family and backed up by a great team of dedicated staff makes having rental properties and tenants easy to deal with. Vicki Zhang has managed my properties for some years now, she is dedicated and experienced in handling any issues that may arise, she is very efficient, has a great attitude and no nonsense approach to getting the job done, I find inspections are carried out routinely and backed up with a detailed photographic report, then any issues are handled promptly and professionally. I would recommend Vicki and the team that supports her to any prospective landlord. 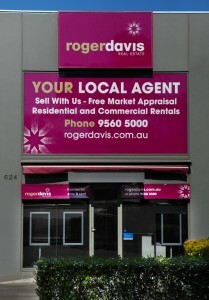 Roger Davis Real Estate has been managing my property for more than 25 years. Kevin is a very experienced and never short of giving good advice in handling rental matters, dealing with tenants. I don't need to spend much time on rental matters. My husband and I have experienced exceptional service from Kevin Tan as our Property Manager for over a decade. He is always willing to receive us at the office should we wish to discuss a matter. Kevin’s condition reports are thorough and backed up with photographic evidence and reporting of any maintenance that needs attention. Kevin Tan has been looking after my property in Mulgrave for many years and I am extremely happy with him. I would highly recommend him and I hope that he will continue to look after my property for as long as possible. Kevin has managed our property for a number of years. Always a smooth process to find new tenants, we haven’t had any concerns with him keeping on top of the things that inevitably come up. I would recommend Kevin as a property manager to anyone in the area - and indeed I already have. My sister and I would like to express our most sincere "THANK YOU" for the very personal and professional assistance that Vicki Zhang and the staff of "Roger Davis" gave to us in leasing our first and only investment property in Blackburn North. Vicki Zhang have shown the utmost respect, not only to myself and the tenants but also to my property throughout all this time! Vicki Zhang gives great attention to detail and is very diligent in all aspects of my rental property. Your work and attitude is exceptional. All problems from the tenant are dealt with immediately and efficiently. In finishing, I can say without any hesitation, I would highly recommend Roger Davis, in particular, Vicki Zhang to manage your property. I would like to write to you to acknowledge the professional &amp; efficient service I have had in dealing with Vicky Zhang from your office. I appreciate all the help on dealing with Tenants. You were always there and followed up on every detail and any queries. I would have no hesitation in recommending you to anyone considering leasing their home. We have worked with Roger Davis for over 15 years and we have always been impressed with their employees and property knowledge. Carol Deane from the Roger Davis team has managed our rental property portfolio in an excellent manner and when the time was right helped us sell a property for a very good price. We couldn’t have asked for a better real estate partner. We would like to thank you for your invaluable services and experience in managing our rental properties. We have use other agents in the past and would not hesitate in recommending you and your team to anyone looking for a reliable and trust worth property manager! You have done a great job in keeping the properties in great shape- and very prompt in dealing with enquiries and organising repairs as well as smooth liaison with tenants. It's a great comfort knowing the exact person responsible for our properties and that you and your team are always available to assists us with any problems should they arise!